Those preaching an individualist ideology fly under the radar of political correctness because they eschew White identitarianism. But, if present trends continue, the individualist culture of the West will become a distant memory as these new peoples assume power in collaboration with White social justice warriors who are already championing the very policies that Peterson abhors. Already in the U.S. the non-White voting share of the Democrat Party is 44%, and this will only increase in coming years as the Congressionally approved yearly influx of more than one million continues. The faith of the individualist is that these newcomers will readily become good Westerners and that the ethnic politics that looms so large now will become a thing of the past—a fateful gamble that will end in disaster as politics becomes increasingly racialized (~60% of Whites vote Republican, and Whites account for 90% of GOP votes), achievement differences among the various groups become a potent source of political friction, and there are declines in social cohesion and willingness to contribute to public goods. These changes are disastrous for the traditional White majorities of the West. Peterson presents a case that Jewish IQ can explain all aspects of Jewish achievement and influence, using an estimate of Ashkenazi IQ in the 112–115 range (and using 115 in his calculations)—somewhat higher than Richard Lynn’s estimate of 110–112. He argues that Jews are discriminated against in admissions to elite universities, citing this Newsweek article. But the article discusses only discrimination against Jews “early in the last century”—certainly true. But what does that have to do with the present? In fact, Jews are very substantially overrepresented at elite universities even correcting for achievement scores, as demonstrated by Ron Unz, (summarized here). Unz describes Jewish intellectual decline, as measured by performance on a wide range of competitions, from the National Merit Scholarship competition (which emphasizes verbal achievement, a traditional Jewish strength), to math and science prizes. In explaining these findings, Unz points to increasing Jewish complacency and lack of effort, supporting his argument by noting that some recent Jewish standouts have been more likely to be immigrants from the former Soviet Union and therefore more likely to be highly motivated. One gets the image of third- and fourth-generation Jews, born to wealth and a sense of entitlement, seeing no need to work hard to ascend to elite status—and being quite correct in that assessment. Further, he notes that an increasing percentage of Jews come from the Orthodox, a group with relatively low IQ. Using an IQ of 130 (which may be a good measure for a meritocratic admission to an elite school) and assuming a high estimate for mean Jewish IQ of 115, 2.1% of the White population would score above 130 while 15.8% of Jewish Americans would. This yields 4.2 million Whites and 948000 Jews with IQ≥130, assuming along with Peterson that there are 200,000,000 Whites and 6,000,000 Jews. 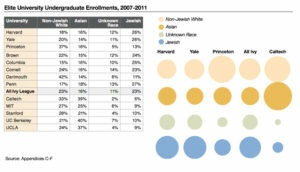 This indicates that Whites should outnumber Jews approximately 4.3 to 1 at these institutions. If you took the top 1% as a good measure (IQ = ~135), these results would be less striking, but remember, these results are calculated using a measure of average Jewish IQ that is at the high end of estimates. But in fact, the percentages in the Ivy League as tabulated by Unz are about equal. Peterson makes his case by using a cutoff of IQ ≥ 145 which lessens the Jewish/non-Jewish ratio substantially but is irrelevant, not only to the great majority of elite university admissions, but also to the great majority of jobs in elite sectors of the economy. Moreover, taking billionaires as an indication of high IQ (>145) is problematic because Peterson fails to produce evidence that billionaires are typically in that very high IQ range. A study by Jonathan Wai found that 57% of billionaires went to elite universities (which Wai interprets as suggesting an IQ in the top 1%) and 88% graduated from college—hardly indicative that billionaires as a group average 3 standard deviations above the White mean in IQ (≥ 99.87% of the population). Further, some industries have vast Jewish overrepresentation that cannot be explained by higher Jewish average IQ. All five of the major Hollywood studios were owned by Jews during the first decades of the movie industry—a monopoly by any other name. And although the industry has become more complex in recent decades, Jews retain a predominant position in the media, both in terms of ownership and production, and this has documentable influence on media content in line with the attitudes of the mainstream Jewish community and to the left of the wider culture (here, xlvi–lvi). Linking Jewish liberalism to the personality trait of Openness is problematic because liberalism is not a notable characteristic of Jews in Israel where parties on the left and center-left are a distinct minority. Meretz, which takes positions similar to mainstream Democratic and Labour politicians in the U.S. and the U.K. respectively, polls around 4% and Zionist Union around 20%. Together they account for around 27% of the Jewish vote. Although the immigration of Ashkenazi Jews from the Soviet Union was expected to boost the left, this failed to materialize as these immigrants proved to be strongly ethonationalist (including the Yisrael Beytenu party headed by openly racialist Avigdor Lieberman). I realize that Israelis on average have a lower IQ than Ashkenazi Jews in the U.S., but surely this cannot explain the general lack of attraction of Israeli Jews to liberalism. Regarding the personality trait of Openness, Peterson’s claims are not based on studies of Jews but on general findings in the literature, typically based on the responses of university students; these are then extrapolated to Jews. In general, while there are significant correlations between IQ and Openness, they do not explain much of the variance. For example, a paper co-authored by Peterson found a correlation of .30 between Openness and g and correlations ranging between .11 and .30 between g and the 6 facets of Openness, with an average of .2. This means that at the high end, the correlation explains around 9% of the variance in Openness; among the facets the range is between 1% and 9%, with an average of 4%. As a result, knowing that someone has a high IQ is a poor predictor that the person is also high on Openness. Moreover, the general take-home message of The Culture of Critique is that the movements I describe were not open to innovative ideas or disconfirming evidence. Participants slavishly worshiped charismatic leaders, like Freud, Boas, Trotsky, and Luxemburg; they formed mutual admiration societies by citing and promoting each other. Dissenters were simply expelled or ignored. Such behavior fits well with the dynamics of historical Jewish groups in traditional European societies. These were characterized by strong tendencies toward authoritarianism, with the rabbi literally having life-and-death power over his group. This authoritarian atmosphere was also a prominent aspect of the Jewish intellectual and political movements discussed in The Culture of Critique. Rather than being open to empirical inquiry and experimentation, dissenters from orthodox positions, such as Freud’s proposed Oedipal Complex, were simply expelled and often defamed in the process. These were all movements connected to the Jewish left. Historically the Jewish left has not distinguished itself by tolerance or promotion of civil liberties. One need only think of the high Jewish participation rate in communist and communist front organizations through the 1950s, and their role as an elite in the Soviet Union during the period after the Bolshevik Revolution at least through the 1930s—the highpoints of mass murder, ethnic deportations, and political repression. In the U.S., the Jewish left has consistently supported a top-down model of elite control and opposition to populism (here, p. 193ff). In this regard it’s interesting that the left in the U.S. and elsewhere in the West is increasingly authoritarian, especially on college campuses where dissenters are publicly shamed and harassed, and dissenting speakers are forced to cancel or are greeted with disruptive, often violent demonstrations­ from the left—hardly a sign of Openness as traditionally understood. Liberals cheer as White identitarians are de-platformed, and broadly defined “hate speech” is increasingly subject to legal penalties in Western Europe and to informal but nevertheless effective sanctions in the U.S. Such laws—which hardly fit with the classically liberal society championed by Peterson—have been promoted by Jewish organizations throughout the West. In general, Jewish political attitudes have not been correlated with social class in a similar manner to non-Jews (“Jews earn like Episcopalians [actually more], but vote like Puerto Ricans,” as Milton Himmelfarb had it). The gap between economic interests and political ideology dates at least from the 1920s. Indeed, for the entire period from 1921 to 1961, Jews on the Central Committee of the CPUSA were much more likely to have middle-class, professional backgrounds and were much more likely to have joined prior to the economic difficulties of the Great Depression. Further, New Left radical students during the 1960sn came disproportionately from highly educated and affluent families. Even successful Jewish capitalists have tended to adopt political beliefs to the left of the beliefs of their gentile counterparts. Or consider Charles Silberman’s comments on the attraction of Jews to “the Democratic party . . . with its traditional hospitality to non-WASP ethnic groups. . . . A distinguished economist who strongly disagreed with [presidential candidate Walter] Mondale’s economic policies voted for him nonetheless. ‘I watched the conventions on television,’ he explained, ‘and the Republicans did not look like my kind of people.’ That same reaction led many Jews to vote for Carter in 1980 despite their dislike of him; ‘I’d rather live in a country governed by the faces I saw at the Democratic convention than by those I saw at the Republican convention,’ a well-known author told me” ((A Certain People, 347–348). This indicates that other reasons must be explored for understanding the Jewish attraction to the left, in particular how Jews see themselves and the wider society. Treatments of Jewish identity among leftists (discussed in Chapter 3 of The Culture of Critique) indicate complex and even self-deceptive Jewish identities. A common theme, apparent, for example, in Norman Podhoretz’s Why Are Jews Liberals? is the “lachrymose” view of Jewish history. This perception of Jewish history is a fixture of Jewish education and self-identity. In this view, Jewish history in the West has been one long veil of tears, from the Roman destruction of the Second Temple, through the expulsions of the Middle Ages, the Russian pogroms of the late nineteenth century, culminating in the Holocaust. The main motivation for the Jewish intellectual movements discussed in The Culture of Critique was the utility of these movements in combating anti-Semitism. During the 1920s and 1930s, a major reason for widespread Jewish attraction to the Soviet Union and communism was because anti-Semitism was outlawed in the USSR and Jews were well-known to have prominent positions throughout elite echelons in the society. Simply having a relatively high IQ does not imply the sort of adversarial culture that is described in CofC. Whereas there has been a strong trend for Jews to have a very large influence on the media, on the creation of culture, on information in the social sciences and humanities, and on the political process, this has not happened with the Oveseas Chinese in Southeast Asia despite their dominating position in the economies of the region and their high average IQ. The Chinese have not formed a cultural elite in Southeast Asian countries and have not been concentrated in media ownership or in the construction of culture. I conclude that Peterson’s analysis is inadequate to account for important aspects of Jewish achievement and involvement in the cultures of the West. I have often said that it would not matter that Jews are an elite if they had the same interests as the traditional peoples and cultures of the societies they live in. Given their high IQ and other traits and proclivities (including ethnic networking), they are bound to be successful in Western-type societies. The problem is that the Jewish elite have not adopted positions that are in the interest of the traditional European-derived peoples of the West and their cultures, particularly with respect to immigration and multiculturalism — an effort that continues into the present and characterizes the entire organized Jewish community. Peterson’s analysis is inadequate fundamentally because it ignores Jewish perceptions of their identity and how these perceptions intersect with Jewish involvement with the left in diaspora societies. Peterson bows down to the powers that be and has grown wealthy in the process. He is the sort of “rebel” the multicultural elites like, one who participates in their censorship of those who would reveal the power of these elites and their hostility to Western peoples and cultures. When Peterson begins to weep for our people, we can be assured he is a champion of truth. Colin DeYoung, Jordan Peterson, and Daniel Higgins, “Sources of Openness/Intellect,” Journal of Personality 73, no. 4 (August, 2005): 825–858. The highest correlations for the facets (.28 and .30) are for Values and Ideas respectively. People on the high end of Values are politically liberal, while people on the low end are more likely to endorse rigid beliefs, such as the belief in one true religion. People high on Ideas like confronting complex problems. The same data are presented in this paper, cited by Peterson in his blog. Coughlin, R. J. (1960). Double Identity: The Chinese in Modern Thailand. Hong Kong and London: Hong Kong University Press and Oxford University Press, 169.